As if Washington didn’t have enough to do, with being the first president, a soldier, statesman, surveyor, farmer, and goodness knows what else, he tentatively embarked on a journey that would begin with Anderson through fields of wheat, rye, corn, and barley and that would end at his whiskey distillery at Mount Vernon just south of Washington, D.C. Whiskey — often alluded to as “liquid gold” — was quite popular during Washington’s day. Anderson had learned from his father in Scotland how to make whisky (where it’s properly spelled without the “e”), and now he wanted to make whiskey (in America with the “e”) in his new home in Virginia. The reluctant Washington didn’t share his enthusiasm, however. His concern was that the distillery would draw a certain type of people from the wrong side of the tracks, so to speak. Plus, he had all those other interests that kept him occupied. Visit www.MountVernon.org or call (703) 780-2000. 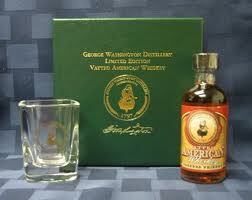 The site of George Washington’s Distillery is on Route 235, about 3 miles south of Mount Vernon. Open daily from 10:00 a.m., until 5:00 p.m., from April 1 until October 31. The Distillery is also the gateway to the American Whiskey Trail, a cultural heritage and tourism initiative of the Distilled Spirits Council in cooperation with Historic Mount Vernon (www.AmericanWhiskeyTrail.com).